Jeff Sundin Fishing Report April 20, 2019 "Melting the Melt-Able"
Jeff Sundin Fishing Report April 18, 2019 "Assessing the Assess-Able"
Cub Reporter Staff #003-IHBFBB is on the beat this morning, heading west to check out the progression of walleye spawning runs in the Brainerd area. That means I don’t have a lot of time to sit at the computer today, but I definitely will have the whole story about that on Friday morning. On Wednesday, I drove a loop around the east side of Winnie and then east past Bowstring. Long story short, there’s still a lot of ice out there, but it is deteriorating. As the accompanying photos reveal, areas of flowing water like the Bowstring River are all wide open. I’d even go so far as to say that areas around some of the smaller rivers and streams are flooding. Water from melting snow has pushed well over the banks and up into low lying swamps. 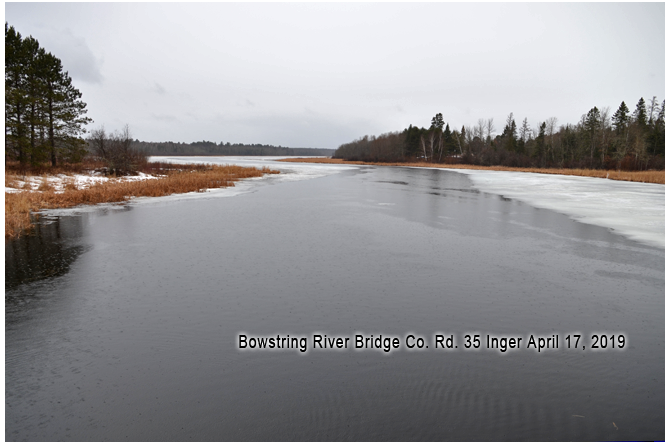 On the bridge at the Winnie Dam, I could see several areas of dark, mushy looking ice out in Tamarack Bay. I think that we’ll see some holes opening up out there this weekend. After that, the ice should begin loosening up and that will accelerate the melt. 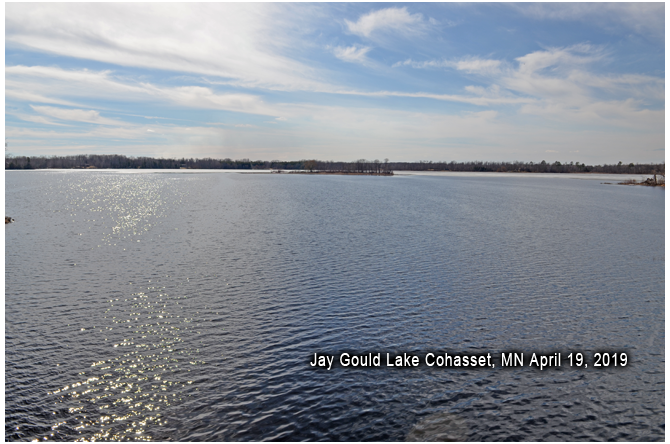 Jeff Sundin Fishing Report April 17, 2019 "Convincing the Convince-Able"
I don’t know why monitoring the progress of ice-out across north central Minnesota brings me such joy. Maybe it’s because I’m excited about the upcoming fishing opener, maybe because it feels good to watch winter melt away or maybe I’m just like all the other critters and get spring fever. Last year, when I was driving around checking ice conditions, I made a special note to be sure that I’d remember to share something with you that I learned about human nature. This is the time of the season when “seeing isn’t always believing”, ice conditions vary wildly from lake to lake. So if I wanted to, I could produce a dozen photos this morning that would all give you the impression that the ice is already almost gone; I’ll call them Exhibit A. On the other hand, I could produce a dozen more photos that all make it look like the ice won’t melt until Memorial Day; I’ll label them Exhibit B. Optimists would see the first dozen photos, Exhibit A and be cheerful. Pessimists would look at the second dozen photos, Exhibit A and be equally cheerful. It all boils down to us choosing to believe the images that support our own pre-conceived ideas. I am the first to admit that I fall squarely into the first group, the optimists. When I drive up to a lake, I am hoping to find evidence that the ice is almost gone. That may be why I’m a little anxious this morning, the ice isn’t going away as fast as I’d like it to. 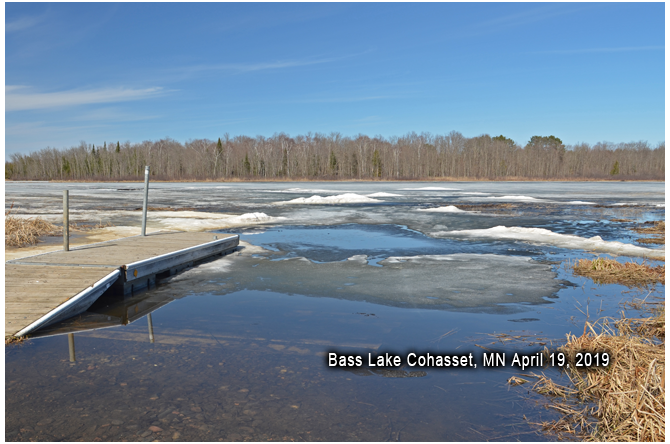 Earlier this winter, I marked April 24th on the calendar as my prediction for the ice-out date on or near Lake Winnibigoshish. Technically, I still have 7 days to be proven “right”, but it will have to be one heck of an interesting week for that to happen; I think. That said, conditions are moving in the right direction, so while I may miss my prediction by a few days, this year’s ice-out will definitely be anything but a late one. I’ll be out and about over the next few days and believe me; I’ll be looking for signs of spring in every corner of every lake. Hopefully, it won’t be long before we start seeing signs of walleyes moving upstream to spawn and panfish moving toward shallow bays. 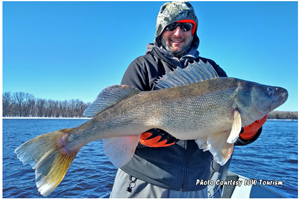 Fish ED April 17, 2019 "Aggressive Slip Float Tactics For Early Season Walleyes"
"This week, host Jon Thelen shows you how to actively find walleye with your electronics. Then Jon teaches you how to know exactly where to position your boat to be sure that you’ll place your offering in front of the fish, where they can find it. The system is easy, Thill Pro Series Floats, paired with Lindy’s Live Bait Jig and tipped with a lively leech or night crawler is all you need. 2012 Lund Alaskan 2000 (20 Foot) Tiller, Camoflauge, 2012 90 HP Mercury OptiMax Tiller with Mercury's Big Tiller. 2012 Shoreland'r Trailer Single Axle With Brakes. This rig isn't my boat, it's being sold by a private party, my nephew Chris Andresen. Still, I am very familiar with this boat and know that it's a good one. You've probably already seen what I've had to say about my own Lund Alaskans and by now you know that I as far as I'm concerned, this is the ultimate "Working Angler's" fishing rig on the market anywhere. 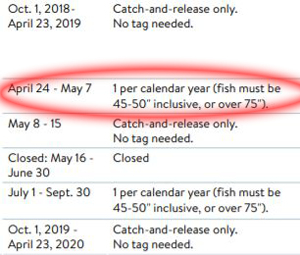 "On the south end of Lake of the woods, the walleye season is closed until the MN Fishing Opener on May 11th, 2019. The target now are both Northern Pike and sturgeon. Pike are staging for the spawn and are open all year long. Back bays are just opening up and will be full of pike soon. A combo of big dead baits or slow rolling a spinnerbait, spoon or crankbait will be the go to methods. Lake of the Woods has a very strong population of trophy class pike over 40" long. All pike 30-40" must be returned with a 3 fish limit and one over 40". On the Rainy River, both the Big Fork and Little Fork Rivers busted open mid week last week. That sent ice and muddy waters into the Rainy River. The walleye bite, which had been excellent until then, was sent into the tailspin and most left anglers with nothing but memories of the many trophy fish that struck during the previous week. Sturgeon fishing remains good as they are bottom feeders and rely more on smell vs sight to feed. It's prime time for sturgeon. Catch and release for sturgeon through April 23rd with the keep season starting April 24th. "Walleye season comes to an end. There was much success until the major rush of ice and flow came down the river on Thursday. The river has been a bit cloudy and continues to be. Generally, it does not affect the Sturgeon fishing. Sturgeon action has been doing well and now with more open water there are people fishing all points in the river and to the Gap. We continue our projects around the lodge to be ready for opener. We will have a couple of charter boats surveyed this week, yard clean up continues, carpet cleaning in progress along with many other projects. It looks like we will stay above freezing this week with highs in the 50’s and sunshine with lows to 34. 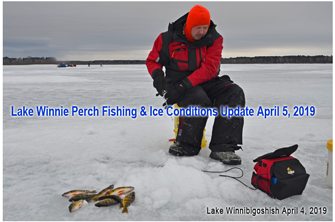 April 15, 2019 "Walleye Presentations For Lake Winnibigoshish"
A) Mike, Walleye fishing on Winnibigoshish was definitely good in 2018 and hopefully it will be again for your re-union this summer too. 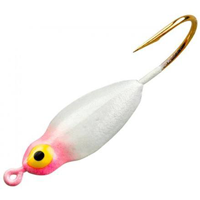 Generally speaking the walleyes in Lake Winnie are and will still be susceptible to live bait presented using Lindy Rigs. The biology of lake itself has changed since your last visit and it may call for a few modifications to your former approach. You’ll notice that since Zebra Mussels took hold in the lake, the water is much clearer these days. 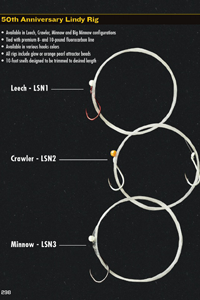 In clear water lakes, longer leaders tied on fluorocarbon line will be helpful. Fluorocarbon line is clearer than standard monofilament and gives you an advantage in clear water. Lots of anglers like using longer leaders for fishing clear water too. I guess this is probably related to better visibility too. Since walleye can see better, they tend to be more shy about terminal tackle, sinkers and the like. Using a longer leader helps keep the bait out and away from any hardware you have tied on your line and gives the live bait a more natural appearance. Another consequence of the Zebra Mussel population is the sharp edges of their shells. In the good old days on Winnie, an angler could simply drop their sinker to the bottom and drag it along the sandy bottom. These days, that practice will result in having your line scuffed and scraped by the sharp Zebra Mussel shells. One adjustment that I’ve made is making a switch to using No Snagg sinkers and fishing more vertically than I used to. Using a ¾ ounce No Snagg sinker, I can easily maintain contact with the bottom without dragging my line across it. I lower my sinker until the line goes slack and then I “walk it over the bottom”. Find the bottom, lift your sinker up a few inches, then walk it ahead a foot or so and lower it to the bottom again. Repeat the process until a fish inhales your bait, then lower your rod tip to be sure that your line is slack and then allow the fish to take line through the slip sinker. Some folks like to tie their own rigs, but you can get the custom touch without going to the trouble. That’s because 2018 was the original Lindy Rig’s 50th anniversary and in honor of the event, it was completely re-vamped. Now every Lindy Rig comes pre-tied to 10 feet using clear fluorocarbon line. A variety of colored hooks are available and beads are included with every rig. You can customize the length yourself, personally 6 to 7 feet long is my standard; make yours any length you like. Depending on the weather and fishing patterns at the time, you may also find showing other preferences. If the water is cooler than average, in the low 60 degree range for example, then jig and minnow presentations may still be good. If the water is warmer, high 60’s to low 70 degree range, then “Wiggle Worming”, trolling spinners or Li’l Guys on bottom bouncers could already be in vogue. Don’t worry too much about trying to prepare for every conceivable scenario ahead of time. As we approach the date of your trip, watch the reports for updates about weather trends and presentations. On your way up, everything you need to catch walleyes will be easily available within easy reach of Winnie. Jeff Sundin Fishing Report April 14, 2019 "Mother Nature's Spring Do-Over"
The storm has passed, the snow is melting and Mother Nature’s spring “do-over” is under way. On Saturday, we took a quick tour of the bridge at Little Cutfoot Sioux. The accompanying photo shows that there’s open water from the bridge out to the pipes where the DNR will eventually set up the egg harvest station. You can also see that Little Cutfoot was still ice covered and since we didn’t drill holes to check ice conditions, it’s hard to say how long it will stay that way. 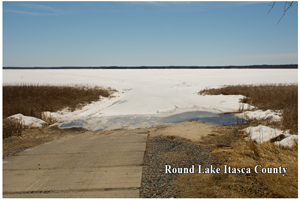 On the west side of the bridge, there was open water for about ¼ mile and the bay between Williams Narrows and Mosomo Point Campground was still frozen too. But, there is another significant patch of open water on either side of the Williams Narrows channel. With snow cover melting in earnest today, today, my guess is that increasing current and warmer temperatures will open up that entire stretch this week. You can monitor some of the progress yourself by checking William’s Narrows Live Webcams. We drove over to the Winnie Dam too and the scene there was similar. A patch of open water on the north (Big Winnie) side of the bridge spanned about ¼ mile. The Mississippi River is wide open and filled with ducks, geese and swans, along with all sorts of other critters too. The water flow is very low and I believe that this is due in part to an agreement with the DNR to keep lake levels a little higher during the spring walleye spawning run. 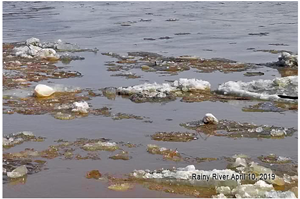 April 2019 — "Post Walleye Spawn Behavior"
Alan Kirkpatrick wrote; “Hi there Jeff, I was wondering what your thoughts may be concerning post spawn walleyes. Q) Do you think that walleyes that become part of (the) egg/milt collection process such as the Cutfoot or Lake Vermillion hatcheries go through a longer post spawn funk than natural spawned out fish on lakes or rivers? Does the extra stress put upon the trapped fish, i.e. the handling & stripping potentially put the fish into a longer post spawn timeframe or do you think there would be no difference? A) Alan, over the years, I’ve heard others describe the post-spawn period as a time when fish go into a "funk". Supposedly, they become inactive and lethargic as they recover from the rigors of spawning. 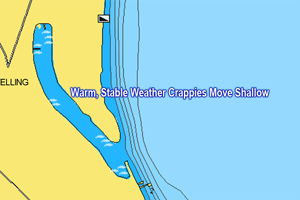 Jeff Sundin Fishing Report April 11, 2019 "Dodging the Dodge-Able"
I dropped my truck off for service yesterday and had a low-level panic attack about not being able to get outside for a few days. But it looks like I was smarter than I thought, if I’m going to be trapped at home, this looks like a good day for it. The stormy weather hasn’t hit here yet, but I guess it will; we just don’t know about the severity of it until it finally arrives. Sometimes Mother Nature has a heart and yesterday, she did walleye anglers on the Rainy River a favor by opening up the Littlefork River. With chunks of icebergs and debris floating down the muddy river channel, anglers have some incentive to stay inside and look at pictures from the past week. I’m sure there are a lot of them because during that time, the walleye and sturgeon fishing had been really good on the Rainy. Walleye action always falls off dramatically when tributaries open up and send an influx of muddy water toward the Rainy. By the time the current flow slows down and the debris clears up, it will already be April 14th and the walleye season will be closed. The cold front that came in ahead of the coming storm slowed down the melting of ice, so there haven’t been dramatic changes since my report on Tuesday. By the time this storm passes, I’ll be mobile again and I’ll be back on track to get more firsthand reports about the progression of ice-out on Itasca area lakes. For those of you who are lucky enough to be near a good trout stream don’t forget that the stream trout season opens this Saturday. 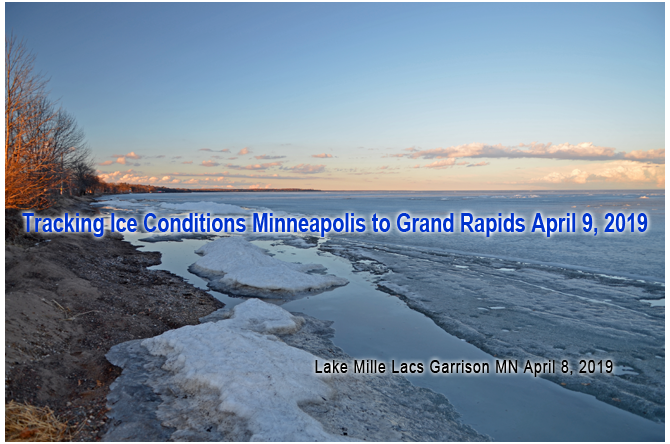 Jeff Sundin Fishing Report April 9, 2019 "Ice Out Progressions And Predictions"
A quick trip to the Twin Cities and back gave us a chance to assess the progression of ice out along the US Hwy 169 corridor on Monday. 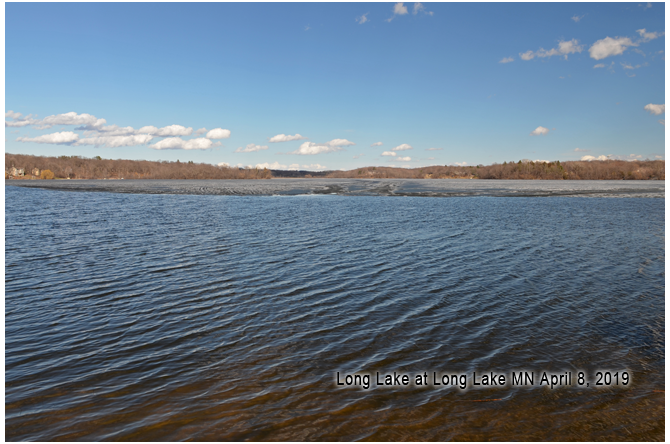 By all appearances, most Minnesota lakes are on track for an earlier than average ice out. In fact, many lakes to the south of Lake Mille Lacs are already ice free and dozens more will be by the end of this week. 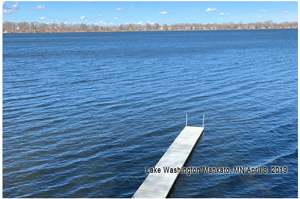 The photo of lake Washington (top left) near Mankato came from Chris Andresen on Monday, he’s got the dock in and is already preparing to fish down there. As we drove the passages between bays of Lake Minnetonka, we saw ice that’s soft, crumbling and ready to give up any day now. 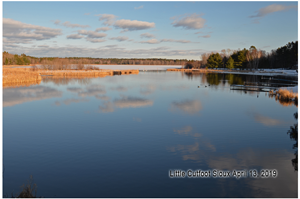 The photo of Lafayette Bay shows that 1/3 of the ice was already gone on Monday; the rest will probably disappear today. Further north on Minnetonka, there was a boat on Smith Bay; the goal of its operator was apparently to hurry the ice out along. We observed him driving along the edges of the slushy ice, breaking it up into small chunks. After we passed by the big lake, we made a quick stop in my old home territory at Long Lake and the ice was disappearing there too. It wouldn’t surprise me to learn that Long Lake is ice free by this Wednesday either. By the time we were on the highway and headed for home, there weren’t many good stopping spots for taking pictures until we reached Lake Mille Lacs. But by the time we got that far, we had already passed by a handful of small lakes and ponds that were ice free. 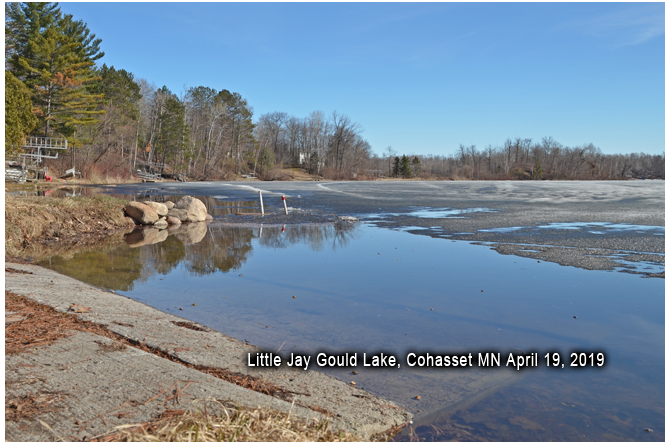 While the majority of larger lakes still had ice cover, they were dark and the edges along shore were cracked. Small pockets of open water near creeks and narrow areas were all filled with ducks, geese and swans. In fact even in the fields, every spot of standing water had some waterfowl sitting on it. The ice cover on Mille Lacs was deteriorating fast too. I was surprised by that because there wasn’t a lot of slush on that lake this winter and while the ice wasn’t super thick, it was solid and clear. I thought maybe it would take a little longer to weaken, but at Garrison, there were already sizeable open spots along shore. Every creek and small river was flowing fast and the current had opened up sizeable pockets of water too. Unless the weather takes a nasty turn colder, I would give the ice on Mille Lacs more than another week to 10 days. By the time we arrived at Aitkin, we were at the upper edge of the “snow free zone”. We hadn’t seen enough snow to make a good snowman between there and metro area, but from Aitkin to Grand Rapids, we could still see snow in the woods, piled up along roadways and in areas where there were deep drifts. Lakes in the Grand Rapids area still have fairly thick ice cover, but it’s deteriorating here too. 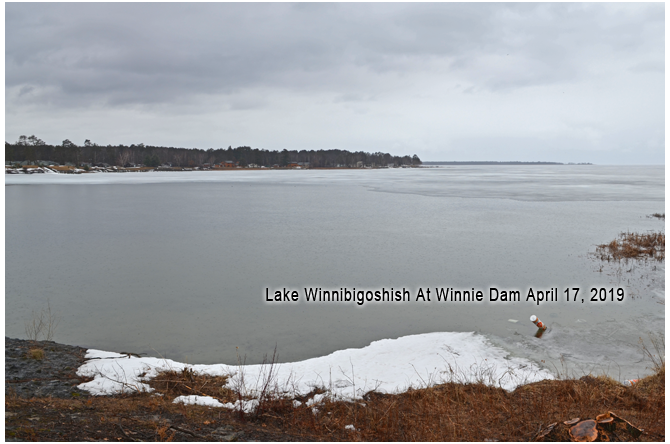 From what I can see, my prediction of an April 24th ice out in the Lake Winnie area is on track to be pretty close. When I checked my emails this morning, I found one more update from Adam Zenzen who wrote; “Never made it out on Pokegama (this weekend). We headed west to Leech and caught perch in the morning and chased Tulibee in the afternoon. 4 of us kept 50 of our 80 perch; all being 9 - 10 inches. We sight fished in 4-6 feet of water on the west side of the lake. If you weren't sight fishing, you were constantly taking off tiny fish. Sight fishing was a pleasant change of pace as i have done it in some time. (It was) a fun, simple way to fish. Even had a few walleyes visit my hole... amazing what a 16 inch walleye looks and feels like after catching perch all morning. Tulibee proved challenging. We moved spots several times and only caught 6. We caught them in 26 feet of water out in the middle of the lake. Most fish (were) suspended 6-10 feet. 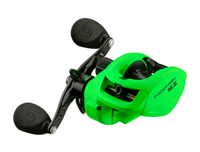 Wired2Fish "13 Fishing Inception SZ Casting Reel Giveaway"
"Building a new reel that holds up, has 18 pounds of drag and looks sweet is what 13 Fishing is all about. Packing technology with features at an attractive price point puts a ribbon on the package. The new 13 fishing SZ combines the latest in technology with a 6-way centrifugal braking system, instant anti-reverse, high spin spool shaft, and a hardened anodized Gen2 worm gear are the guts of what makes it special. The Arrowhead line guide system allows for smoother and longer casts too. This reel has precision written all over it. The 13 Fishing Inception SZ retails for $150.00. 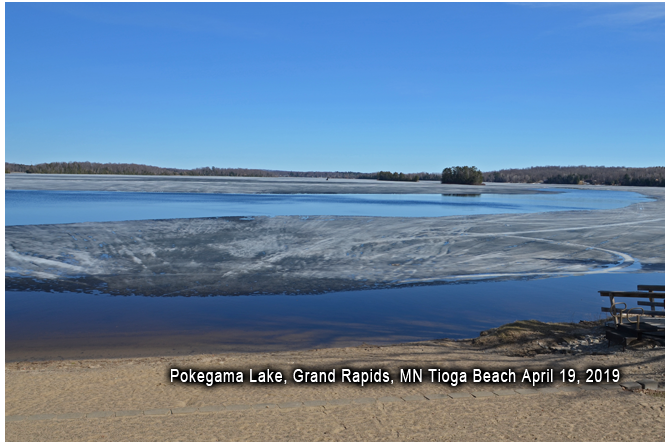 Lake Winnibigoshish The Pines Resort April 5, 2019 "Lake Winnie Ice Conditions Better Than Expected"
Ice conditions on Winnie were better than we expected on Thursday. 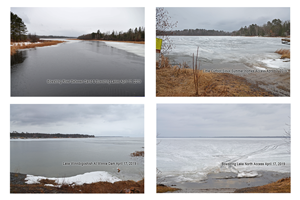 The ice covering Tamarack Bay is still thick, probably 24 to 28 inches in most areas. Snow cover is almost entirely melted, the surface has drained dry and conditions for either walking or ATV travel are ideal. Unfortunately, access at the landings is beginning to deteriorate, so we’re afraid that our ice fishing days are numbered. From what we observed on Thursday, accessing the lake from anywhere in our bay near the dam will be tricky. We were already forced to close our road because of open water at the point, just up the shoreline from The Pines Resort. Mud and standing water prevented us from using the old dirt landing near Plughat point and a user developed trail located just east of the Plughat Landing was getting pretty sloppy. For the weekend, our guests will likely be better off accessing Tamarack Bay using one of the sand landings coming out from Bowen’s Flats. We expected the fishing action to be really good on Thursday because we’ve been hearing great reports from folks who have come into the resort over the past several days. In the end, we did pretty good, bagging enough fish for a meal. While we did catch good numbers of perch, sorting was required to good ones. Maybe the weather change was partly responsible, after a few days of mostly sunny weather, the skies turned grey. Northern pike like this kind of weather and there were lots of them roaming the flats yesterday. We noticed that when pike were present, perch disappeared from the screens of our flashers. Whenever we caught a pike and cleared the area, perch would return fairly quickly. Although many lures caught fish yesterday, there was one in particular that caught most of the largest fish. It’s an ice jig that looks identical in every way to Lindy’s #4 size Frostee jig (pictured right), but the color was different. Ours was solid pink and we can’t find that color in their current listings. Tipped with a whole, small size fathead, this has been a winner for us all winter long. We don’t know for sure if these jigs were from a batch of “knock-off” lures or if it’s just a discontinued color. We do know that there are other variations of the original Frostee Jig still available and we’ll do some experimenting with other colors and let you know how that goes too. By all accounts, we’re on pace for a fairly routine spring, ice out shouldn’t be more than a few weeks away. Even though we’ll be focused now on getting the resort ready for the open water season, we’ll still have some updates about conditions as we approach the walleye opener. Wired2Fish "Pouring Soda on Fish Gills: Does it Actually Work?" "It has unfortunately happened to all of us. No matter how experienced of an angler you are, every once in a while we all have a fish that gets hooked in the gill. Immediately we remove the hook and hope this doesn’t cause the fish any harm and that it doesn’t bleed. Fish bleeding tends to be a worst-case scenario for an angler and we thought we could answer a few questions about the best practices for an angler when they face a bleeding gill. Wired2fish contacted me to learn more about a few things. First and foremost, they wanted to know the best practices to help a bleeding fish after being hooked in the gill. How long does it take a fish to recover? Finally, does pouring soda on a fish’s bleeding gills actually work? April 5, 2019 — "Pokegama Lake Walk-In Access For Tulibee?" Thanks for the note Adam; I live in Grand Rapids too, so I definitely wish that I knew a good quick walk-to spot on Pokegama. Friends and acquaintances who use dark houses on Pokegama have told me that they do have random Tulibee sightings on Pokegama. From everything I’ve learned though, populations of them are low and getting in on a “hot bite” will be tricky. I did a quick check of the MN DNR Fisheries Survey that was conducted in July 2015 to learn their assessment of the tulibee population. “Tulibees are difficult to sample with our standard summer nets because they frequently school in the open water where our nets are not effective. Catch rates on Pokegama Lake have ranged from 0 to 8.2 fish per gill net but have not been above 0.5/gill since 1984. In my mind, 19 to 20 inch Tulibees are whoppers, so I’d be pretty happy to catch even just a couple of them. But I know too that most folks expect more action out of fishing trip than that. Instinctively, I feel like I should direct my attention toward the main basin of the lake and portions of Sherry’s Arm. 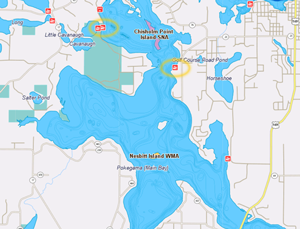 But looking at the map, there are really only two areas that stand out in terms of walk-in fishing spots. The Golf Course Landing and the Tioga Bay Landing both offer short walks to deep water habitat, click here to enlarge the map. Both areas have potential, but both are unproven to me, I’m only taking an educated guess. I have a lot of friends who fish Pokegama a lot and maybe one of them will be willing to share a tip or two, if so, I’ll post an update. Otherwise, if you decide to try it, let us know how it goes. Good Luck! Jeff Sundin Fishing Report April 4, 2019 "One Last Weekend On The Ice; At Least"
I wish I could tell you that we have a weekend filled with gorgeous fishing weather on tap. But the more often I check the weather forecast, the more boldly rainy weather is predicted. Let’s just imagine that the forecast is wrong and the weather is dry this weekend. Then you can definitely spend a little more time on the ice. The current ice conditions remain good, colder daytime weather combined with below freezing overnight temperatures have delayed melting this week. The surfaces of most lakes in north central region are drained dry now, conditions are excellent for walking and if you’re careful, ATV’s as well. But I have not heard of, or seen anyone driving a pickup truck on the ice anywhere this week. Reports of good perch fishing have come in from Leech Lake, Pike Bay and Bowstring. Crappies and sunfish have been spotty by most accounts, but folks are finding fish. In fact, I received a call yesterday from a friend who says that there are crappies biting on his lake. We are headed there today to find out for ourselves and that will give me a chance for at least one more firsthand update about current ice conditions. Anybody who cares already knows that folks have been fishing on the Rainy River all week. Even though I’ve seen some nice looking photos of big fish, the reports overall haven’t been all that great. Apparently, anglers are catching large females that have moved into the river early. But the vast majority of fish continue to hold outside of the gap on the big lake. There are still quite a few folks ice fishing and as of a few days ago, they were reporting 36 inches of ice. Travel conditions are good for ATV’s and I’m told that there is still enough snow to allow for snowmobiles, if you’d choose to travel that way instead. The weather forecast for Baudette actually looks promising for Saturday, so it wouldn’t surprise me if there were robust crowds on the ice. I'll post one more quick update about ice conditions on Friday morning and after that, I'll wait to see how the weather unfolds this weekend. It appears likely that this will be the last weekend that we can be assured of good ice conditions, but you never know, that could change if it stays dry. 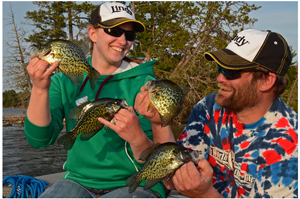 April 3, 2019 — "When Is Best Time To Fish pre-Spawn Crappies?" 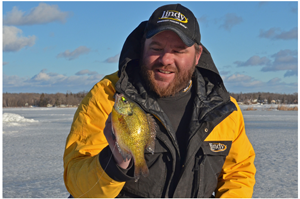 Q) "So, now that we're approaching ice out, when is the best time to fish crappies? I've heard "as soon as the ice goes out". To me that means the day after it goes out. And then I've heard water temps of 55 degrees, which could be a few weeks later. Would you help set the record straight? A) Frank, the truth is that good crappie fishing can be found both at ice out and also later, as the water warms. The real secret to success lies in knowing where to find them during either of these periods, or any other time of the year for that matter. The other truth is that for me, this period between ice out and spawning season is the time when I am least likely to succeed consistently at catching crappies. That’s because these nomadic fish come and go so often that it’s hard to always be in the right spot at the right time. That said, there are some rules of thumb that will give you a fighting chance at finding them. 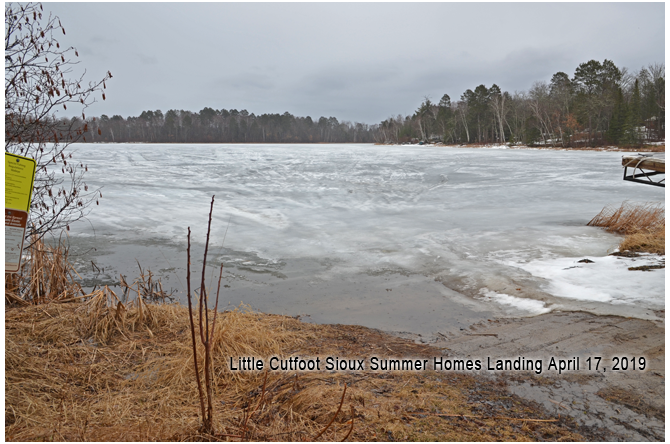 At ice out, as the shallow bays and backwaters of a lake open up, fish will move into them very quickly. In some instances, they don’t even wait until the main body of water is ice free; they make their move into the open waters almost immediately. The problem is that these movements into shallow water don’t usually last very long. Over the years, I’ve understood this early movement to be a feeding foray. But recently, I’ve been convinced that oxygen levels have as much or more to do with it than does food. As the ice goes out, freshly oxygen replenished water becomes rich with life; temporarily. Once the entire lake becomes ice free and oxygen is replenished everywhere, then comfort becomes more important. Crappie location will now depend on discovering areas that provide the right combination of food, structure and comfortable water temperatures. Now the fish will move in and out of shallow water whenever conditions favor one location over another. Warm, stable weather encourages crappies to move toward places like shallow bays, lagoons and boat harbors. On sunny days, woody structure that warms quickly will attract fish, so will dark bottom areas, shallow weed patches and man-made structure like piers and boat docks. 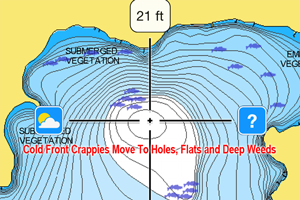 Cold fronts force them out of the shallows and back out into open water where they may either suspend as large schools, or spread out horizontally across the bottom of deeper, main lake flats. If my goal was to find and catch pre-spawn crappies, I would be very selective about the lake(s) that I choose to fish. They would be small, shallow, land-locked lakes that don’t connect to other lakes via rivers or streams. They would contain high populations of average size crappies; this increases the odds of finding fish. On the lake, I would search deep water early in the morning and on cool, cloudy days. On sunny days, I’d begin checking shallow water during the warmest periods of the day. At evening, I’d work the breaklines where large, shallow flats lay adjacent to deep water. If I could find cabbage weeds on a flat, I would pay particular attention to them. I know that still leaves you with an awful lot of variables, but that’s what pre-spawn crappies are; variable. 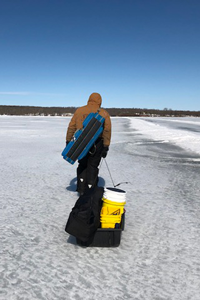 April 2, 2019 — "Can We Find Fish-Able Ice This Weekend?" On April 1, Joe Kerstetter wrote; “Good Morning Mr. Sundin. I’m looking at making one last run out ice fishing. My target area is Round Lake in squaw lake area and some of the surrounding lakes. You have given a report for that area in the past. Do you know how well the ice conditions are in that area and if it even worth the trip. I’d like to try to make it my final trip of the year. Any help or advice would be greatly appreciated." A) Joe, Ice thickness on area lakes now ranges between 20 & 26 inches, snow cover is almost completely melted and the surface of most lakes is now dry. So over the next few days, there will be plenty of ice out on the lakes. The only limitation will be whether or not the landings remain useable. 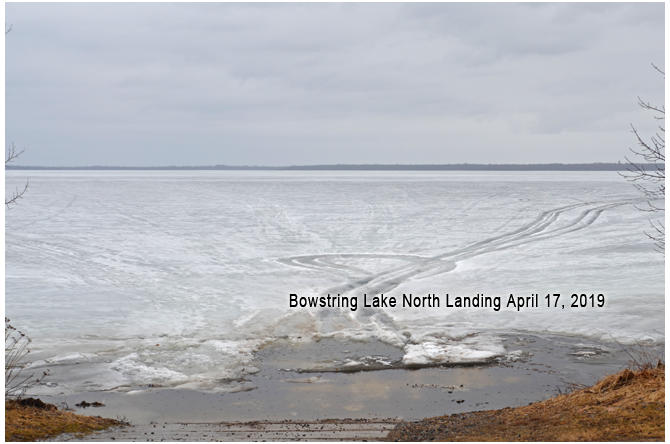 The accompanying photo was taken at the north landing on Round Lake on March 29, 2019. As you can see, the ramp had deteriorated a little, but it still wasn’t too bad. At that time, the parking lot was almost full, there might have been 8 or 9 rigs parked there. There were also several rigs parked at the south landing, but because of mud and traffic, I did not drive down to the landing to examine it. There was nobody travelling on the lake using pickup trucks; they were all driving ATV’s. All of the fishing traffic was concentrated in a small area and anyone who was willing to walk, could have found numerous places to fish in complete privacy. It’s been cold since then, temperatures have been below freezing much of the time, so conditions have not changed much. 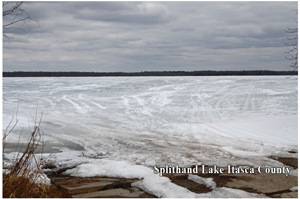 At right, you'll see another photo taken at Splithand Lake near Grand Rapids yesterday, April 1, 2019. The two lakes are very similar in depth, water color and structures. Based on those similarities, I do think that you’ll be able to find ice that’s stable enough for fishing this weekend. But judging by the weather forecast for later this week, I’d say that conditions at the landings are gonna get sloppy this weekend. High temperatures above 50 degrees on Friday and approaching 60 degrees on Saturday will surely soften the ice and make muddy conditions at landings. If I was planning a trip, I’d try to move it up so that I could arrive here before the weekend. If that isn’t possible, then I’d make walking, rather than ATV's part of my master plan for travel. I’m not saying that you shouldn't bring your 4-wheeler along, I’m just saying that you should have a "Plan B" to fish lakes where travel on foot is a good option. "At the past Bassmaster Classic, Chad Warner and his team from Booyah introduced a new smaller Toad Runner for those days when the biguns want a smaller profile offering. They now have a standard and junior size in their best colors ready for the marketplace and froggy time of year. "On the south end, good walleye and pike reports for the last week of March. The last day to leave fish houses on the lake overnight unattended was March 31. Some anglers still ice fishing with collapsible houses. Pike action still hot and pre-spawn fish have the feedbag on. 12' hot depth with live sucker minnows or deadbait on quick strike rigs. Walleyes open through April 14, pike season open continuous. Auger extensions needed. On the Rainy River, it's game on for open water walleye and sturgeon fishing. Boat ramps at Birchdale and Frontier open. More open water on river daily. Big fish being caught. Jigging with a minnow or plastic working well. Some trolling crankbaits with success. Lots of sturgeon. Remember, catch and release only for walleyes through April 14. Catch and release for sturgeon through April 23rd with the keep season starting April 24th. Fish ED April 2, 2019 "Missouri River, Early Season Lindy Rigging For Walleyes"
"Chomping at the bit to get onto open water and catch some walleyes? Lots of folks are! Western reservoirs offer great walleye fishing and April is a great time to get started. That makes this a great time to join Fish Ed host Jon Thelen as he heads to the Missouri River system to fish with guest Jim Klages for early season walleye. Jeff Sundin Fishing Report April 1, 2019 "Sightfishing Crappies and Bluegills — No Foolin'"
On Saturday, we drove over to the Fosston area where we met up with my friend Bob Bohland and his father in law, Ron Rupp. Crappie fishing was the plan and based on Bob’s past experiences, the timing should have been perfect. But on this trip, crappies were tough to come by. Instead, it was bluegills that commanded our attention on this trip. As you see in the photos, the ice conditions were perfect for either walking or for driving an ATV. Almost all of the snow cover was gone and the surface was dry. Except for a very small patch of shallow water located at the access ramp, there was no sign of standing water anywhere on the lake. I and Austin jones arrived first and decided to start walking toward the fishing spot rather than wait for Bob to arrive with his ATV. Walking was about as easy as it gets, the surface of the ice was coarse and crunchy and our footing was secure. Both of us had cleats on and they helped prevent slipping when we walked across the shiny spots. By the time we drilled our first holes, we found about 24 inches of ice. But it was not solid ice, in most areas where we drilled; it was already saturated with water. My auger delivered fairly large chunks of ice mixed with water to the surface. In some areas, there was a thin top layer of re-frozen ice over the top of a slush covered “main” ice sheet. In Bohland’s judgement, that’s why there weren’t any anglers on the lake. “As soon as they roads go bad and folks can’t drive out in pickup trucks, almost everybody quit fishing. That’s just the way it works out here”; he said. For me, it was odd to out on a beautiful Saturday and have nobody else around, but I guess it gave us lots of room to work. During the morning, we struggled to find any consistent action. Most of the fish we marked were perch and most of them were small. Ron was picking up some decent bluegills, but only occasionally. It was hard to say if our timing was bad, or if we simply hadn’t found the fish yet. If it had been colder outside, we may have done a lot better, a lot faster; let me explain. All morning long we had been fishing outside under the bright sunshine. But by mid-afternoon, my daughter Annalee and the Hippie Chick were coming to join us. The girls “don’t do cold” and that meant it was time for me to set up the portable fishing shelter. Once ours was set up, Bob figured that he might as well set up his portable too and that’s what led to a discovery. Knowing where the fish were helped, but the bright conditions made triggering strikes difficult. I’d say that we had to see a dozen fish before one of them would strike. But even if they didn’t all bite, seeing them constantly made the trip really fun and we did catch enough fish to provide Bob’s family with a nice fish fry. Whether or not the fish in your favorite lake will be riding this high in the water column depends on oxygen levels. 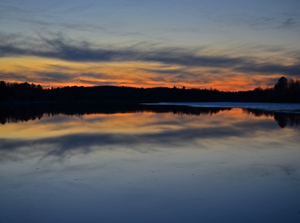 Not all lakes suffer from oxygen depletion during late winter. But if you believe that the lake you fish does, then remember to check for high riding fish. As snow melts and the water drains, oxygen is replenished in the area just below the surface; that’s why the fish show up there. Oh, and if you’d like a more detailed explanation about the affects of oxygen depletion during late winter, refer to the report I wrote earlier this winter. >> Is Bowstring Lake Affected By Oxygen Depletion?